When the Montreal Canadiens face the Carolina Hurricanes this Sunday, the NHL game will be called in Plains Cree during a historic broadcast. Sportsnet and the Aboriginal Peoples Television Network say it will be the first NHL game to air in a Cree language. 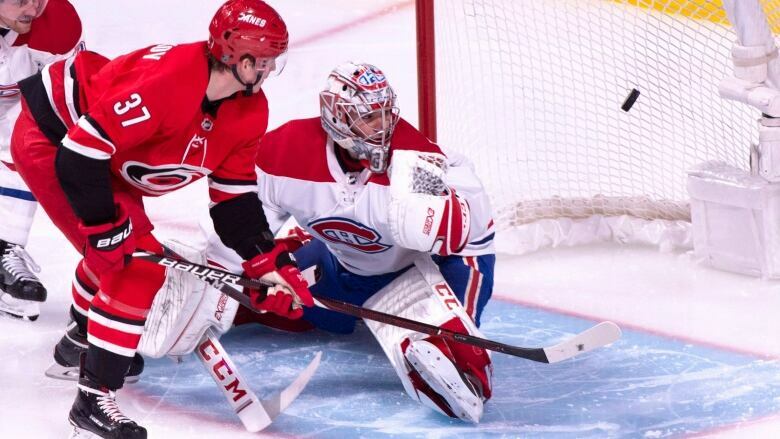 When the Carolina Hurricanes host the Montreal Canadiens this weekend, the NHL game will be called in the Plains Cree language, a historic first in broadcasting. Sportsnet and the Aboriginal Peoples Television Network (APTN) say it will be the first NHL game ever aired on television in a Cree language. "It's a big deal for many, including myself," play-by-play announcer Clarence Iron told CBC Edmonton's Radio Active this week. Live coverage of the Hurricanes-Canadiens contest will air Sunday on APTN at 7 p.m. ET / 4 p.m. PT. The broadcast will take place in conjunction with the Rogers Hometown Hockey festival, which is making a stop this weekend at Enoch Cree Nation on Edmonton's western boundary. Iron, who lives in Pinehouse, Sask., will be joined by studio host Earl Wood and retired NHL player John Chabot, who will provide commentary and analysis. "A lot of Cree-speaking people told me, 'You should one day maybe call a game in the NHL in Cree,'" Iron said. "Now it's going to happen." Decades of experience prepared Iron for the role. He's a host at the northern Saskatchewan radio station CFNK. He has called many Indigenous hockey tournaments over the years and sometimes dabbles in play-by-play Cree during local games. Iron worked in radio for 20 years, then retired and worked in northern Saskachewan mines for about 10 years before returning to broadcasting at CFNK. He said he doesn't feel nervous stepping into the role for APTN. "My language, I think, is really up to par, because that's what we carry out here: our Cree language," he said. "So the Cree will be no problem. It's just trying to remember the names and the numbers — and, you know, I think I got it." Wood, from Saddle Lake, Alta., is a member of Grammy-nominated group Northern Cree. He said he hopes the hockey broadcast will inspire young viewers. "I feel like it's going to be a wonderful catalyst for our young people," Wood said, "to ignite, and to invigorate and to enhance the beauty of the language, which helps us identify our authentic selves as Indigenous people and the world view that comes from." Chabot said he believes there will be more television broadcasts in Cree and in other Indigenous languages. "We want to use this as an opening to something further and having it every week," he said. "Right now it's going to be hockey — it's going to be something that interests a lot of communities, and we want to see it used going forward." Wood said he'll be thinking about his grandchildren while he's on the air, as well as the grandparents who will be watching. "Everybody who has ever played hockey in Indian territory and everybody who has ever spoken that beautiful vibratory language of Cree has had a hand in where it's come to now."